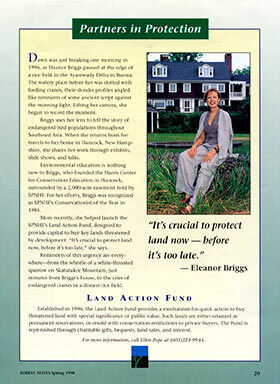 The “Partners in Protection” series, produced in 1997-2000 for the Society for the Protection of New Hampshire Forests, is a series of promotional profiles featuring more than a dozen donors and the various ways they chose to support the land conservation organization. The goal was to tell a short story about each donor and, ultimately, to inspire others to give. Two samples are included below. When they came to New Hampshire in 1944, Charles and Louis Tallman bought 30 acres with a house, a view of New Hampshire’s Pawtuckaway Mountains, and a woodlot. For fifteen years they managed their plot, cutting and pruning, clearing and thinning, cultivating the woods. They remember it as a good chapter. Today the Tallmans live on the seacoast, surrounded by acres of grass. When they want to be out among the trees, they head for the town forest, which they’ve adopted. They walk the trails, planning what could be cut, looking for marketable [ine and oak, marking maple of firewood. With the town’s blessing, they clear brush and prune limbs, working alongside trails where walkers come daily to enjoy the woods. “this is our recreation,” they say simply. The Tallmans believe in managing for beauty as well as for economics. They believe in doing what’s best for the forest locally—and across the state. That’s why they’ve established an endowment fund that benefits the Forest Society. Their gift helps to write more “good chapters for New Hampshire’s forests and the people who love them. Dawn was just breaking one morning in 1996, as Eleanor Briggs paused at the edge of a rice field in the Ayarewady Delta in Burma. The watery plain before her was dotted with feeding cranes, their slender profiles angled like remnants of some ancient script against the morning light. Lifting her camera, she began to record the moment. Briggs uses her lens to tell the story of endangered bird populations throughout Southeast Asia. When she returns from her travels to her home in Hancock, New Hampshire, she shares her work through exhibits, slide shows, and talks. Environmental education is nothing new to Briggs, who founded the Harris Center for Conservation Education in Hancock, surrounded by a 2,000-acre easement held by SPNHF. For her efforts, Briggs was recognized as SPNHF’s Conservationist of the Year in 1985. More recently, she helped launch the SPNHF’s Land Action Fund, designed to provide capital to buy key lands threatened by development. “It’s crucial to protect land now, before it’s too late,” she says. Reminders of this urgency are everywhere—from the whistle of a white-throated sparrow on Skatutakee Mountain, just minutes from Briggs’s house, to the cries of endangered cranes in a distant rice field.